Distorted Acoustic Guitar… on Purpose? Anyway, the acoustic guitar in this song is the only instrument that plays throughout the tune from start to finish. That’s why I gave it such a prominent place in the mix. But there was something about the way the acoustic sounded. Normally, I’m all for a very clean, crisp acoustic guitar sound. But this time I didn’t think it worked well for the song. So what did I do? I added some distortion to the acoustic. No, it wasn’t a super-obvious, “hey that sounds like Iron Maiden” amount of distortion, but enough to change the tone to (in my opinion) really fit the song. That’s the thing about music, you’re always trying new stuff (or you should be). Never a dull moment. 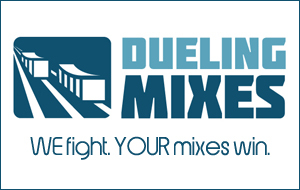 To see my exact technique for “dirtying” up the acoustic guitar without completely ruining it, perhaps it’s time you became Dueling Mixes member. It shouldn’t be fair that we have this much fun.